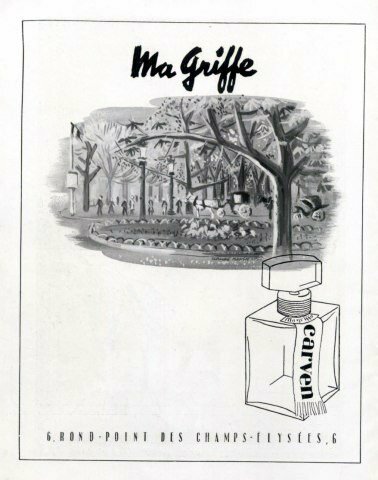 Ma Griffe (1946) (Eau de Toilette) is a popular perfume by Carven for women and was released in 1946. The scent is chypre-floral. The production was apparently discontinued. 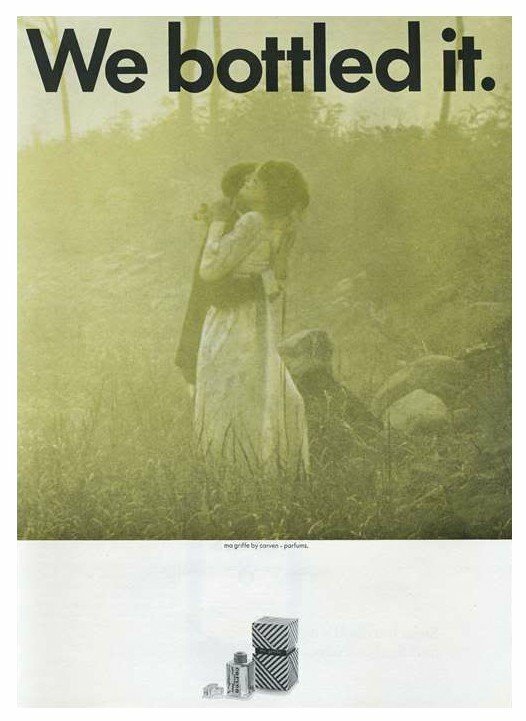 The scent was re-released in 2013. 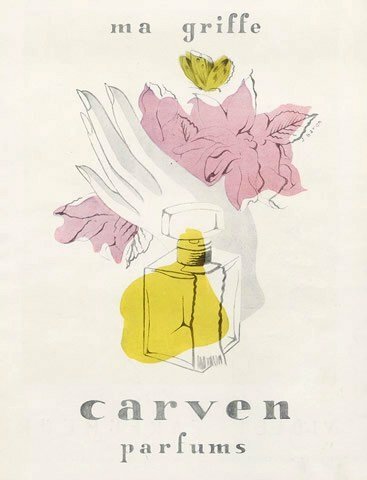 The perfumer Jean Carles lost his sense of smell while he was still actively producing fragrances. It appears he hid the fact that he was completely anosmic in order to continue working, multiple sources report this due to personal conversations with him. His odour memory and imagination were good enough to continue to create great perfumes - like Beethoven who continued to compose music despite deafness. 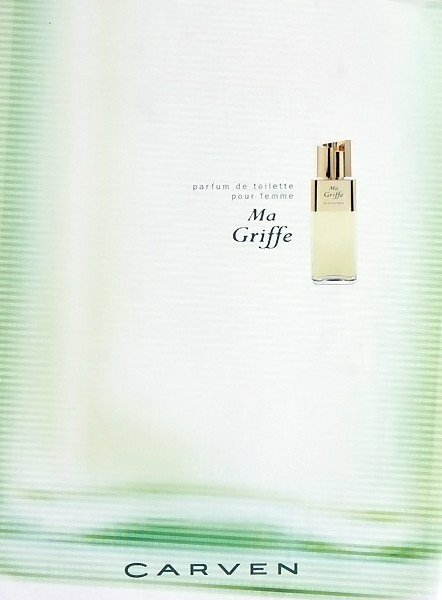 Ma Griffe is the fragrance most notably affected by Jean Carles' anosmia, though in 1947 he went on to work with Serge Heftler Louiche and Paul Vacher on the original Miss Dior. 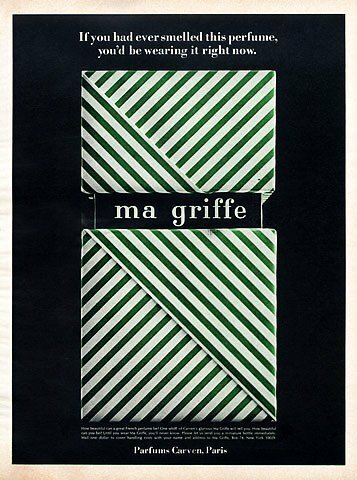 Furthermore rumour has it that Ma Griffe was introduced to Parisians in 1946 by hundreds or even thousands of tiny, white and green parachutes, each containing a sample of the scent, that were dropped all over Paris. As a result, for the next few days the smell of Ma Griffe lingered through the entire city. I was really glad when I got my sample from MA GRIFFE. 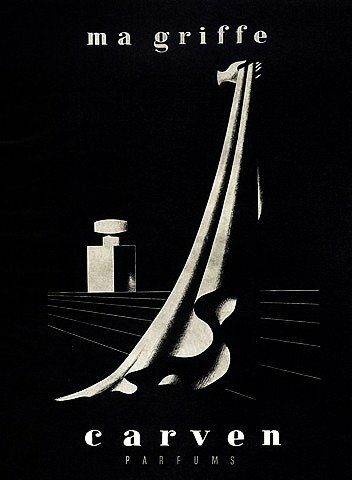 Unfortunately my body wears an armor against this perfume, and MA GRIFFE recoiled, like a scared snail. I donned it 3 times and was still almost completely unable to smell it. A gentle, creamy, not too sweet scent sneaked away from my nose, and that is all. 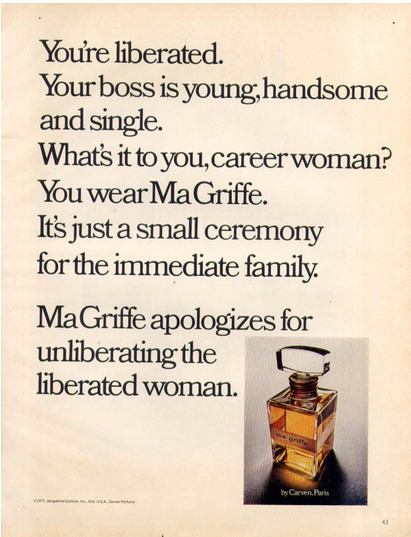 I think if my chemistry would cooperate, MA GRIFFE would be a really nice perfume. 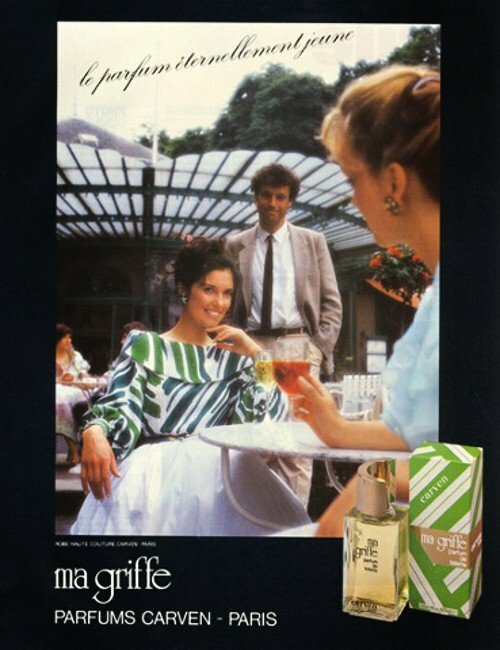 Carven MA GRIFFE is an exciting perfume. 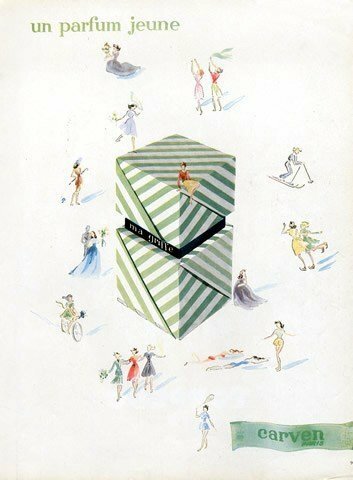 I am grateful to all of the perfumistas who praised this worthy creation to the high heavens, since on their recommendation I bought a gift set online and was thoroughly delighted! 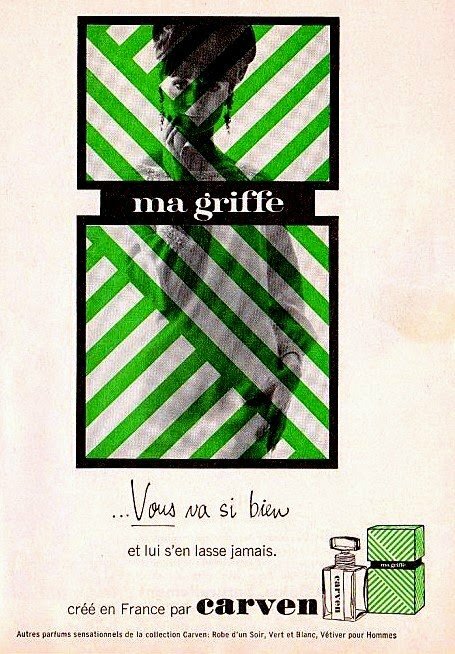 MA GRIFFE is totally green and utterly unique. MA GRIFFE is a huge pile of freshly cut grass clippings under a bright blue sky. MA GRIFFE is a vast expanse of glistening green rice paddies in rural Japan with not another soul anywhere in sight. This may be what I wanted CABOTINE to be, though unfortunately it never measured up to my dream: clean, green, briskly aldehydic, white floral pristine perfection...and also chypre! MA GRIFFE effects an immediate change in perspective but without numbing the mind. To spritz on MA GRIFFE is to step outside of Plato's Cave and stare directly at the incandescent sun. I may sound like some sort of religious zealot, but MA GRIFFE simply further confirms my longstanding belief in survival of the fittest when it comes to matters of value. There's a reason why this extraordinary creation still exists and has no even close competitors. In the perfume jungle red in tooth and claw, MA GRIFFE has managed to hold her own, to retain the claim she staked so long ago. Animalistic spirit Cinnamon brings depth and a bit of an edge; Watered musk dilutes the volume but noticible. Ma Griffe and I have immediately got on. Aldehydes with a splash lemon introduce themselves. The flatteries then begin. It gets gentle, powdered and quite soft. The flower notes greet and swirl about me breezily but not sweetishly. The spell is broken. The base with oakmoss, musk and sandelwood rounds off wonderfully. Ma Griffe is holding back and relaxing. A close friendship has begun. 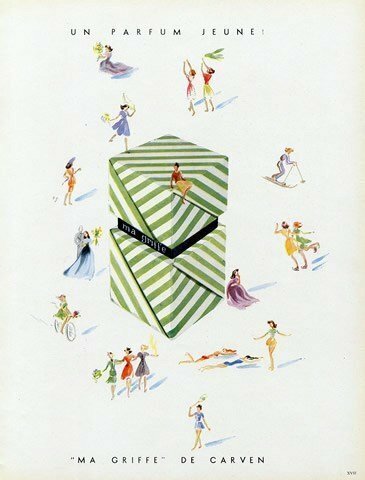 This green dream easily and breezily walks into my shopping basket. 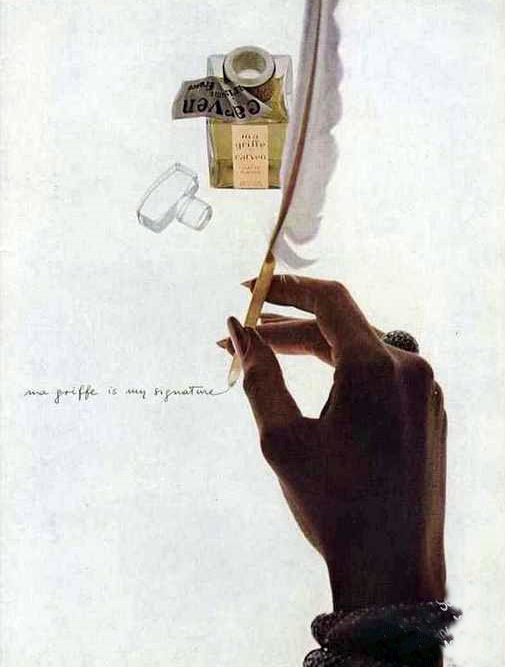 Write the first Review for Ma Griffe (1946) (Eau de Toilette)!